There is something really magical about glitter. It instantly makes me happy. Reminds me of fairy dust, I am sure it's not just me. 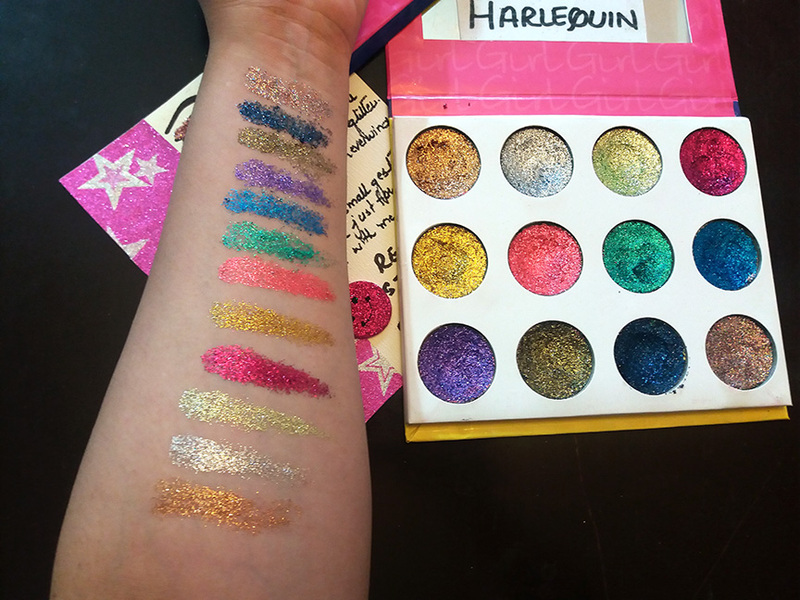 When I got the Harlequin pressed glitter palette by Beauty World I was not able to stop drooling. Glitter is love! I remember going to Khori Garden many years ago, a wholesale market where you can mainly find books and other interesting items, glitter being one of them. There are not many glitter shops but I did discover a little shop with just one light bulb with big bags full of glitter of all colors, stacked every where till the roof. I thought I had stepped into a little nook in a faraway tree, simply mesmerized. I can never forget that moment. What can one do with glitter. Its such a wonderful, messy yet playful, thing. As a makeup lover I don't restrict myself to just eyes, I prefer experimenting with my lips too. News Flash, glitter lips are actually trending! 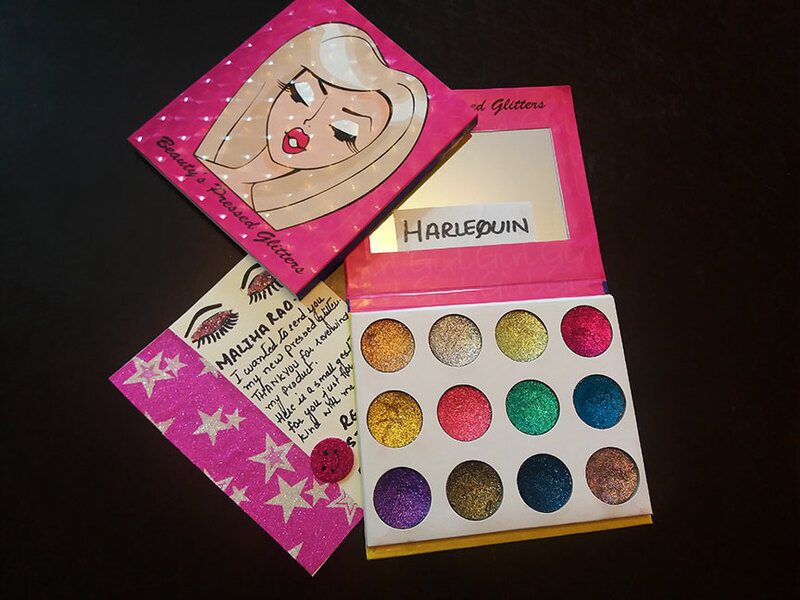 There are not enough glitter brands available locally so when Beauty World started their pressed and loose glitter palettes I was ecstatic. 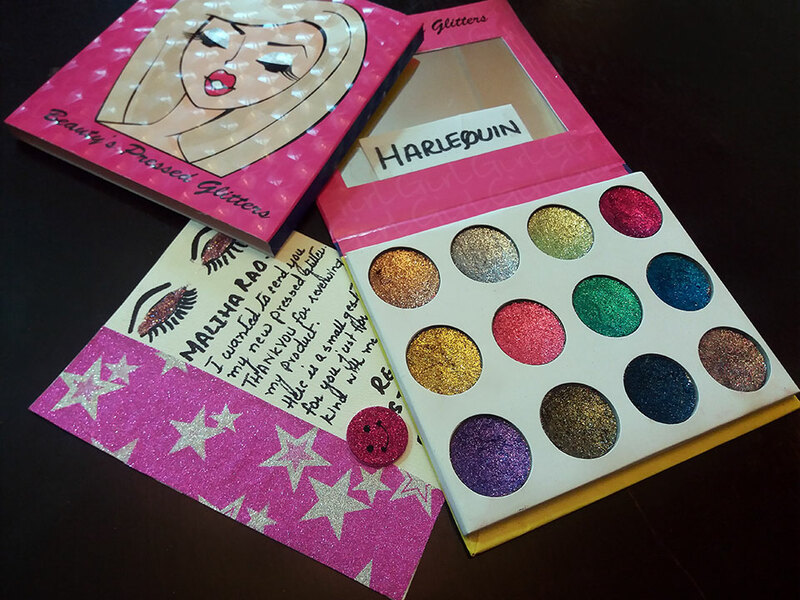 They sent one of their palettes called Harlequin for review and for few minutes all I did was stare at the lovely glitter. The packaging is very simple, made all of cardboard, very similar to many The Balm cosmetic's packaging. I really like the holographic cover and illustration. Its very pretty, indeed. I am sure that as it's a local venture and they just started the packaging will improve with time. Glitter used for makeup is different from the one we use for arts and crafts. The main reason being that most of the time glitter is preferred for creating eye makeup and chunky glitter can damage your eyes therefore art glitter cannot be used as an alternate. When I received the Harlequin pressed glitter palette from Beauty World I felt the glitter was chunky. However, I discovered that Cosmetic glitter also has grades. Chunky, medium grade and extra fine (almost powdery). Grading is done as per the size of the glitter grain. 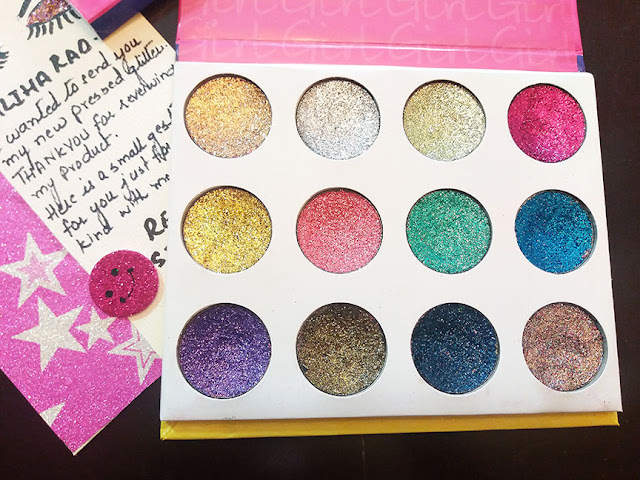 The Beauty World glitter is a mix of chunky and medium grade in texture, however they do not specify if the glitter they are using is cosmetic grade. The pressed glitter is quite easy to use. It has a mousse like formula and you don't need to mix it in any glitter medium to apply on the eyes. I do recommend primer for a better hold. The color variations are beautiful though the consistency of every glitter varies as per color. Dark blue and Multi colored glitter as well as the sea green one was a bit flaky compared to the rest but that didn't bother me much. I wear lenses so I have to be extra careful no matter which glitter I use. PLEASE don't rub your eyes, no matter what. This Palette is available for only PKR.1,500/- from BEAUTY WORLD and can be purchased online from their FACEBOOK page. Stunning 😍 it looks gorgeous. The packaging looks so adorable!I'm curious, how do they smell?